There comes a point in every parent's life where they have to make a decision as to where to send their kids to school. If there is a choice to be made, it often is a very tough one. Parents often feel that their child's future is at play. 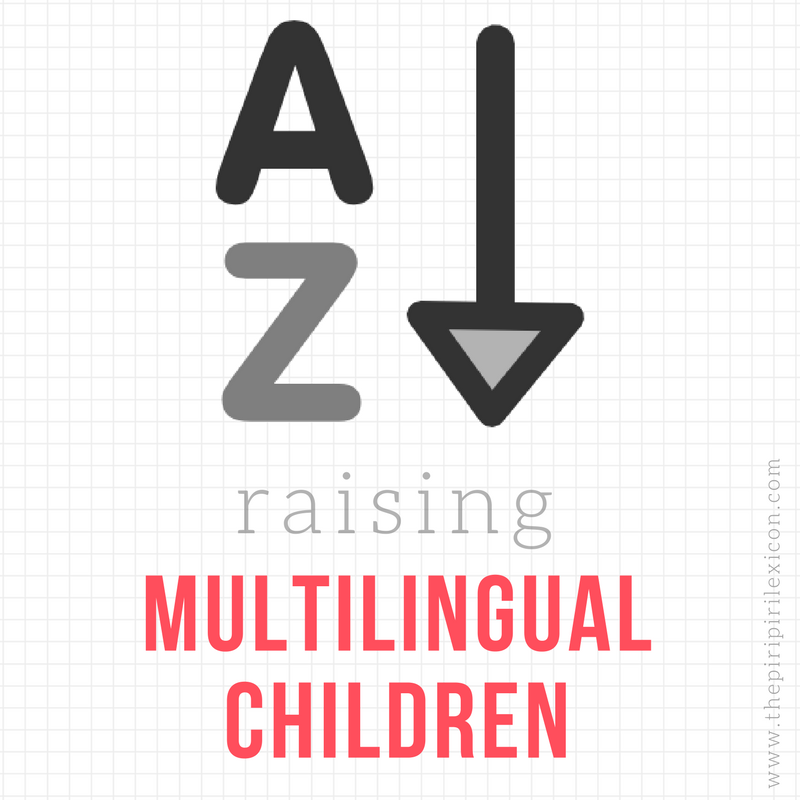 When you add to the equation languages and how best to support your child's multilingualism, it makes it even more difficult. This week, I was tagged into a discussion on Twitter about this article. 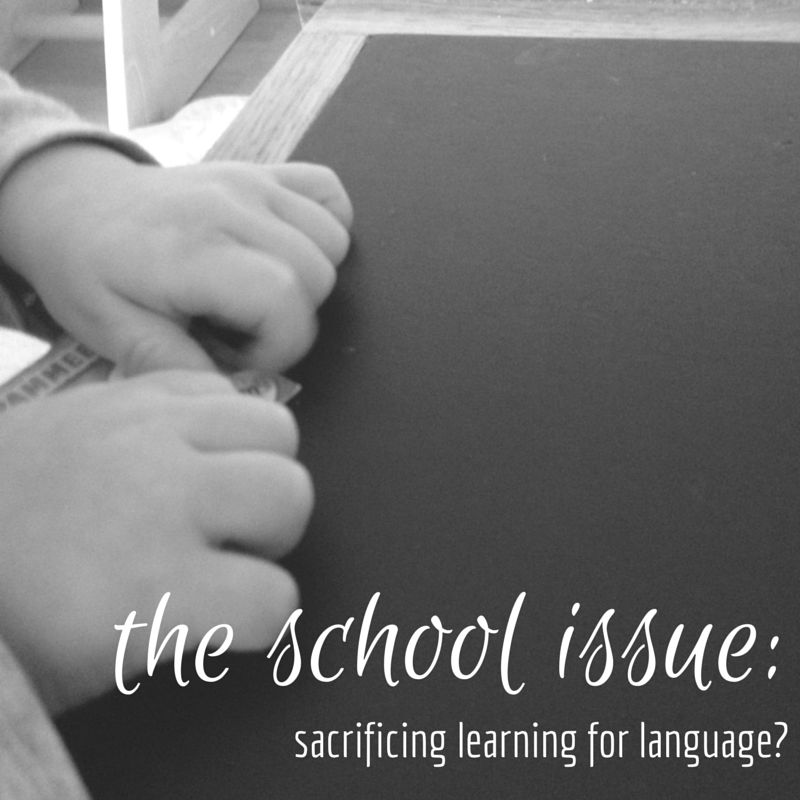 In 8 things I wish I'd known about French immersion, Emma Waverman laments about the French immersion program she sent her son to and explains why she is pulling him out of it. The basics of the arguments revolve around the fact that she expected the school to be a kind of elite school with high quality teaching and something a little different from the rest. While this is totally comprehensible, I think the assumptions are, let's be honest, a little foolish. Her arguments make it look like she should have done her homework better before signing up. There is a reply to the article, written by Miriam Porter which makes some good points. Yet, to me, the main issue here is about the quality of the immersion programme / of the school. What is the point of signing up for an immersion school if the school is not a good fit for your kid? 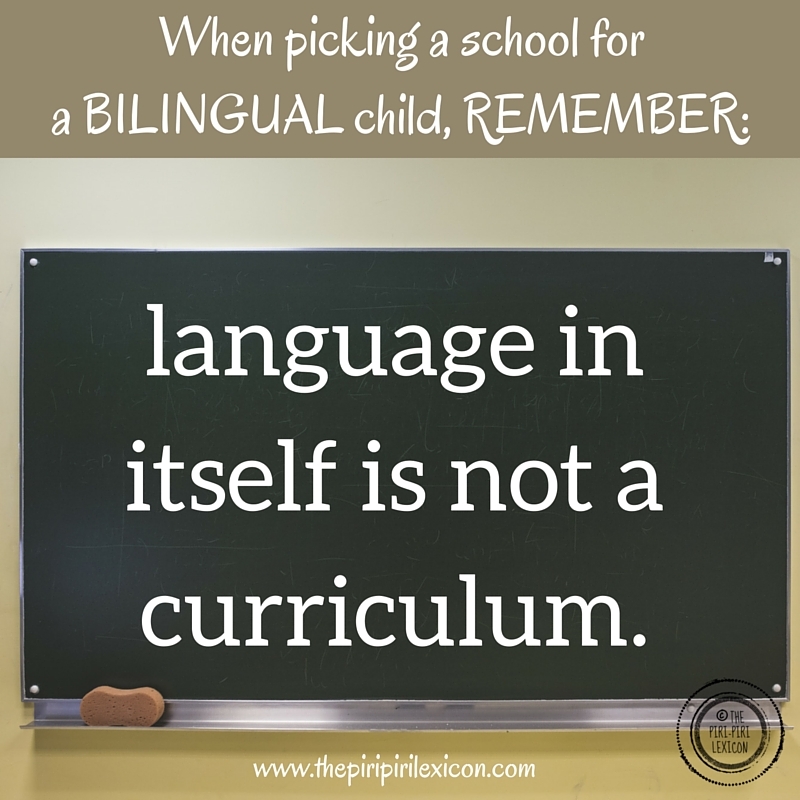 Bilingualism is great and has many advantages but language in itself is not a curriculum. The school's curriculum, philosophy, quality of teaching should also be questioned. 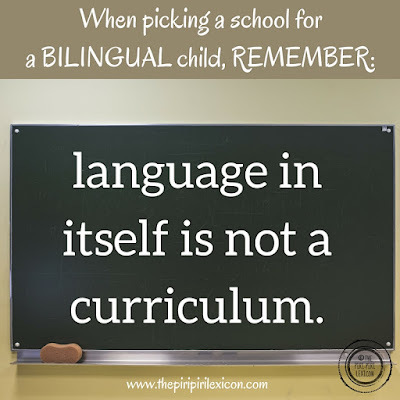 There is no point sending your child to an immersion school just because it sounds good on paper and s/he will learn French if the teaching is of poor quality and you do not agree with their methods of teaching or learning. Personally, LJ we will be facing this issue next year and it is on my mind constantly. We have been very lucky with a bilingual kindergarten (French-German) which is cheap (subsidised by the state), of excellent quality and that we love. When we moved here we went into it a little blind but it turned out great. It is not the closest to our house but we knew that was a very small compromise to make. We have also secured a spot for baby E for next year. Children start school at 6 in Germany. So we will have a choice between the standard local school, a state school with a bilingual section or an international fee-paying school. Homeschooling is not an option here and I am not a big fan anyway. The local school is a brand new one with shiny new facilities, local kids, within walking distance but also with teething problems (or even a lot of them if I can believe the rumours) and no language option. The other state school we would consider is one that is across town but that has a bilingual (French-German) section starting from the first year. How it works, whether we would at all get a place remains to be seen but we are investigating. Finally, the international school is a typical European school with plenty of foreign kids from parents working for European institutions with 3 language sections (English, French and German) and some great activities and interesting curriculum. But, it is not cheap (read: €€,€€€ not cheap). We knew all along this choice was coming when we moved here and to be fair, we are lucky. We are lucky that we even do have a choice. Not many cities the size of ours has a European school. Yet, I cannot help but feel that on the other side of the border (10km away from us), in France, there are many more options where languages are at the forefront of the programme and are state schools. Strasbourg, the nearest large French city (an hour away), has many primary schools with bilingual sections, partly, because it hosts the European Parliament and so there are many families from all over Europe. More choice? Not really because I am not one for having a husband who does not see his kids during the week. He travels enough that when he is working here, he should be with us after school or I might as well be a single mum. As Third Culture Mama puts it, we have been living the dream (language-wise at least) up to now and are struggling with the choices. We still have a few more months to take a decision, so watch this space. Have you been in this situation, what would be your best advice? Of course, it is great when language permeates in all areas (and it should) but language should not replace a decent curriculum. We would not be entitled to frontaliers status because we live and work in Germany. We would have to either live or work in France. And I am not a fan of being home late when they are still really young (it applies to any member of the family). Tough choice, we are also dealing with that. Most probably we will chose an international school.